Christmas Ornaments Made in USA - Red Sparkle Peace & Noel Ornament Balls - Set of 4 - A Christmas Ornament Co. Celebrate the Christmas season with your family by decorating your tree with these beautiful glass ornaments. These red colored glass balls are made in the U.S.A. and are the perfect home decorations for you and your children to display this holiday season. The rich red color of these ornaments makes these glass balls visible from almost anywhere in your house. 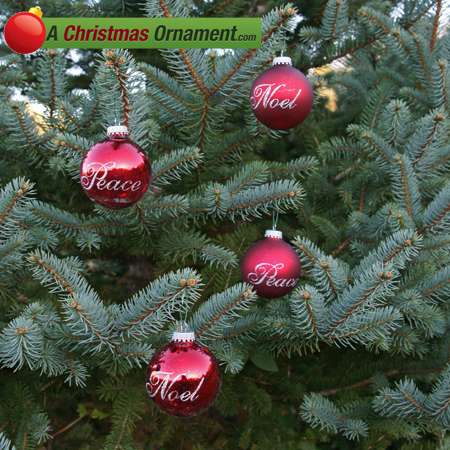 This set Christmas ornaments comes with two ornaments each with gold sparkle lettering of the words, "Peace" and "Noel". Noel is an alternate word for Christmas and comes from the French word Noël meaning "Christmas".